At the center of “Mansfield Park” is Fanny Price (Kayla Carter), a “poor relation” of the fabulously wealthy (if seriously dysfunctional) Bertram family which owns the grand Northamptonshire estate of the title. As a young girl, Fanny, the oldest of nine children in the impoverished family of Lady Bertram’s younger sister, is sent to live with her rich relatives and to serve as a much-berated companion to Mariah Bertram (Anu Bhatt), the spoiled daughter in a family that also includes a dictatorial father, Lord Bertram (Mark Montgomery), his neurotic, laudanum-taking wife, Lady Bertram (Hamill), and two sons – the kind and courtly Edmund (Gabriel Ruiz), who considers becoming a (poorly paid) clergyman, and his rebellious, dissolute older brother, Tom (Curtis Edward Jackson), who will have a rude awakening when he accompanies his father on a business trip to Antigua. Although initially unschooled, unworldly and badly treated by everyone, including Mrs. Norris (Heidi Kettenring), her officious aunt who manages the manor, Fanny finds a kind friend in Edmund. And her innate moral compass, discretion and canny, instinctive sense about the character of the people around her, are her salvation. Her mantra becomes, “I can learn,” and indeed she does, as she closely observes the behavior of those who possess far greater money and privilege, but far less heart. She is a romantic, not an opportunist, and despite temptation, she understands that no amount of financial security is worth the price paid for marrying a man one does not love. The trouble begins with the arrival of several outsiders – first the half-mad Mr. Rushworth (Jackson), and then a pair of snobby young socialites – the dissolute Henry Crawford (Nate Burger), and his shrewdly calculating sister, Mary (Hamill). Fanny is repelled by Crawford, who makes her the focus of a nasty “hunt,” but he also is keenly attracted to her because of the challenge that comes with her dismissal of him. But it is Mary who most worries Fanny because by now Fanny has fallen for Edmund, and Mary has clearly set her sights on marrying him for what will be his formidable inheritance. It is not until the second act that the transformed Fanny returns to her own destitute family in a Portsmouth slum, encountering a bit of culture shock as she is reunited with her mother (Kettenring), feckless, alcoholic father (Montgomery), a ragged younger brother (Burger), younger sister (Bhatt), and her most beloved brother, William (Jackson), who wants to get ahead in life but has no connections. There is more, but for that you must see the show and enjoy the uniformly superb cast. Of course it is the portrayal of Fanny that is of the utmost importance. And Carter, so raw and awkward at first glimpse, morphs into the loveliest of swans in the most poignant and subtle ways – always conscious of the truth and falsity in those around her, suffering much heartbreak and many crises of conscience, and finally, learning to be happy. 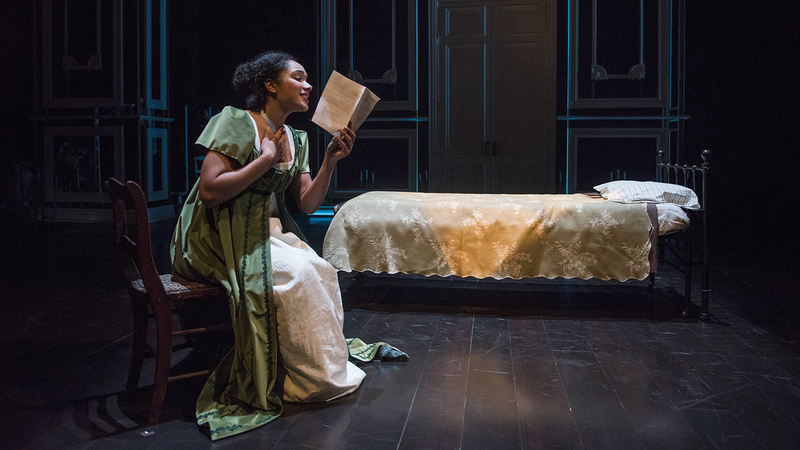 “Mansfield Park” runs through Dec. 16 at Northlight Theatre, 9501 Skokie Blvd., Skokie. For tickets ($30-$88) call (847) 673-6300 or visit northlight.org. Running time is 2 hours and 20 minutes with one intermission.